Posted November 4, 2014 by Michael Kent & filed under Features, Tech Features. In the late 1980s, General Motors contracted with the California-based firm AeroVironment to develop the Impact electric concept car. It was the prototype that evolved into the infamous EV1 production car. While designing the Impact, AeroVironment needed the ability to test large-format battery packs for automotive applications. However, at that time, essentially no one else in the world was developing EVs, and the tools to efficiently build and test battery packs didn’t exist. “So we developed and built it ourselves,” Jonah Teeter-Balin told Charged. He is the Director of Product Marketing at AeroVironment’s Efficient Energy Systems division. There are three general classifications of battery-testing equipment: cell, module and pack-level. Cell-level testing requires smaller equipment, often providing channels for cycling many cells at once. Module-level testing is performed on one assembly of multiple cells. Pack-level testing usually includes all the parts of the fully assembled system – the cooling, controls, etc. AeroVironment then began to sell its ABC-150, which provides power up to 125 kW, to battery test labs and other automotive companies. As the market grew, its customers came back asking for a product to conduct more sophisticated testing and to test bigger batteries. So, the company designed the AV-900, which is capable of providing testing power up to 250 kW. To meet the new demands of a battery-powered-everything world, AeroVironment worked closely with customers to solicit a lot of feedback, and has announced its next-generation pack tester: the AV-900 EX. The new and improved product is an extension of the benchmark AV-900, with a lot of improvements in key areas. One unit by itself still delivers a maximum of 250 kW, but the company has built in the capability to run up to four units in parallel for 1 MW of power. With new digital controls, the AV-900 EX is able to protect itself against issues that can pop up during testing and cause costly downtime. Over the years, AeroVironment found that customers were really aggressive, and were using the systems to experiment with a lot of new tests. The company says that it wanted to continue to enable users to push the limits, in ways that could not even be foreseen, and without as much risk to the system. One example of a downtime-causing error is grid fluctuations. AeroVironment has found that grid power and building power are not always clean, particularly in some international markets, and that can interrupt testing procedures. The AV-900 EX has new safeguards that are activated if the grid power fluctuates substantially, so there is no impact on testing at the system level. Also, within the pack or module test itself, users can set soft limits. If a variable exceeds its limit on the battery side, the technicians are notified and can stop the tests to adjust the settings accordingly. Error reporting and soft limits have always been a part of AeroVironment’s testing products, but with new digital controls, the AV-900 EX has improved that feature set substantially. Digital controls let users get to the cause of an error much more quickly, to get the test back up and running. AeroVironment announced the new AV-900 EX in September, and is ready to start shipping in January. The company thinks this product will appeal to many new markets. One of the main reasons for the equipment upgrade was the feedback that AeroVironment has received from its other partners outside of the automotive world. 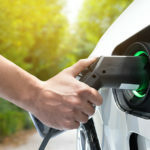 A big part of its business is in military hardware, and those customers are beginning to look at new battery applications for heavy military use. With a 1 MW maximum power rating, four AV-900 EXs in parallel are within the range of some stationary energy-storage applications – another fast-growing new market segment. The new unit even has a mode that can test solar panels under different light conditions: diffused, direct, angled, hot/cold, etc.